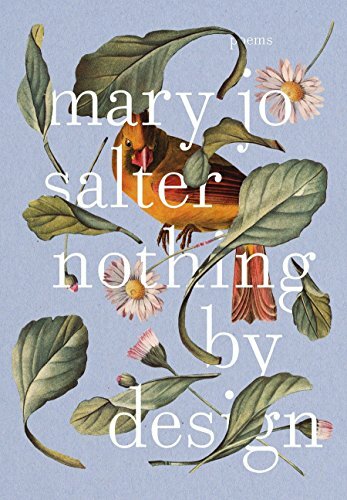 Given the title of this collection, Nothing by Design, by Mary Jo Salter, we can assume that no overall design was in place at its beginning, but that much of value was pulled together, knotted, and otherwise secured and arranged for scintillating effect. In exploring this varied collection, expect to encounter pithiness of content, elaboration of timely forms, a stair-stepping through wide (even world-wide) recollections and experiences, direct or indirect, born of a long relationship with the poetries and prose of the past, in themes that have broad implications in the lives of so many today—nothing by design except perhaps salvation itself. In these poems, Ms. Salter is scrupulous in her deft handling of metaphoric surprise and appropriateness as well as poetic closure. The reader will be exposed to a plethora of locales, elegies, dedicatory pieces, to poems of loss, of commitment and exactitude, to poems covering a full range of human passions, aspirations and quests, as well as human failings and disappointments. Throughout the book, Ms. Salter makes skillful use of formal elements, rendering received forms with a breezy contemporaneity. From the smooth envelope quatrains of “Voice of America,” dedicated to Joseph Brodsky, to the enviably inventive sestina, “Crusoe’s Footprint,” form is not only integral to this collection, it is consistently well handled. In addition to her skill with lyric poetry, Ms. Salter is a highly competent narrative poet as well. In giving attention to wisdom as a component to something surely of design, she reminds the reader that there can be a price or reckoning paid for misadventures. Ms. Salter is a poet of astonishing range, moving from narrative translation to skillful lyric with ease. An exacting poet, her forms, philosophic forays and her inventiveness appear as carefully measured portions. The concept of poetic “field notes” seems characteristically Salterian—with Ms. Clampitt’s complex poetry of light as a source. While these poems reflect a long history of deep study of the traditions of poetry and literature, Ms. Salter nonetheless maintains a clear and distinct voice and evocation of her own, the voice of a poet both inventive and unique in the idiom. She acknowledges a particular debt to Elizabeth Bishop with whom she studied and expresses her admiration for the work of Richard Wilbur. Nothing by Design is a wide ranging work, well worth reading, a collection destined for a well-deserved place in American letters. This is a book about meeting challenges, about finding and moving oneself into pathways of light.